The art of tea is an ancient ritual and practice. The cause of wars, espionage, riches and disease, all true tea comes from the Camellia Sinensis plant. The differences are the result of geography, growing conditions and methods of processing. Worldwide, tea is second most popular beverage, behind only water. American’s consumption of tea is growing – dramatically with specialty teas experiencing the biggest growth in recent years. Loose tea is always preferable. Most commercial tea bags use tea ‘dust’ instead of the full leaf which will give you a much higher quality and flavor of tea. All tea has caffeine. 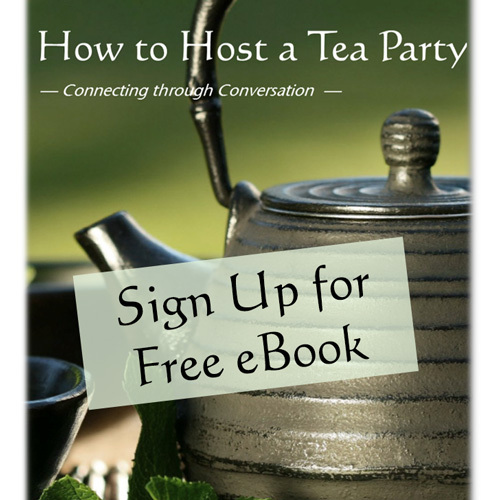 Yet, the debate has continued for years about how much caffeine the various types of teas have. Some believe it is related to the steep time – the longer it steeps, the more caffeine. Thus the prevailing thought that black tea has the most caffeine. However, recent reports indicate that the only the short steep time of white tea prevents it from having more caffeine since it often includes the new leaf tips which may actually contain more caffeine. See below for comments about “herbal” tea. Highest in anti-oxidants & undergoes minimal processing. The resulting brew has a light color and flavor. Generally, white tea should be steeped in water between 170 and 180 degrees for 1-2 minutes. Silver Needle is considered the highest-grade white tea. Most white tea comes from China, while more recently Sri Lanka and India have begun producing good white tea. Rich in anti-oxidants and worldwide it is the most popular type of tea, mainly because of its popularity in Asia. Green tea has dramatically less caffeine than coffee. Generally, green tea should be steeped in water about 180 degrees for 1-2 minutes. There are several varieties of green tea, including Sencha, Matcha and Gyokuro. Each variety has its own distinct flavor profile. Dragon Well is considered one of the highest-grade green teas. Partial fermentation and has less caffeine than coffee. Considered the most complex flavors of teas, Oolong teas can offer multiple infusions as they release different flavors with each steeping. Water temperature varies from 185 for green Oolongs (3-4 minutes) to 210 for darker varieties (up to 6 minutes). Typically a black tea that undergoes a unique fermentation process called post-fermentation, in which the tea leaves undergo a microbial fermentation process after they are dried and rolled. It can be purchased either as loose leaf or compressed bricks, some of which carved with interesting designs. Full oxidation and the most popular type in the US. It is what most of us grew up drinking in tea bags, especially the sweet tea of the South. Popular black teas are Darjeeling (sometimes called the champagne of tea), Ceylon and Assam (the base of most Indian Chai). Steep in near boiling (200-210 degree) water for 2-4 minutes. Herbal ‘tea’ isn’t really tea as it is not made from Camellia Sinensis; therefore the proper name is ‘tisane’. 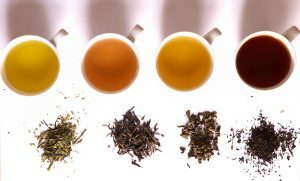 There are three main types of herbal teas: Rooibos (roy-bus), mate’ and herbal infusions that are typically an infusion of herbs, flowers and fruits. Mate’ does contain caffeine and is often a favorite among serious coffee lovers because it gives similar energy as coffee without the jitters. Rooibus, also called Red Tea comes from South Africa, is caffeine free and full of vitamins and minerals.